Whether the wedding photos are being taken (and the guests are eating canapes), or you’re just about to sit down for your wedding breakfast. Alternatively, if the evening party is just about to start – hiring Steve as your wedding magician, to mix and mingle between your guests is the perfect wedding entertainment idea to inject something unique and highly memorable into the day. You’ll be able to get on with enjoying your day knowing that the rest of the guests will be enjoying themselves with some sophisticated, yet discreet, wedding entertainment. 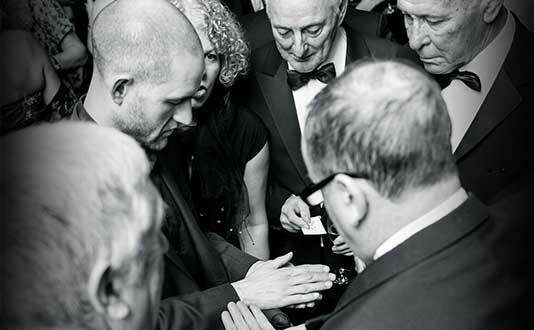 Often called ‘walk-around magic’; mix and mingle-style magic is incredibly versatile. During a large part of the wedding day, the guests (and the bride and groom) will be on their feet doing their own ‘mixing and mingling’. Whilst having some background music to wash over your guests is enjoyable and sometimes memorable – more often than not, it doesn’t stand out, and it certainly doesn’t make your special day, extra unique. Hiring a wedding magician can bring a real peace of mind to both the bride and groom. Steve’s skill set allows him to bring wedding guests together in small groups so that when they finally sit down for the wedding breakfast – many will have already met. 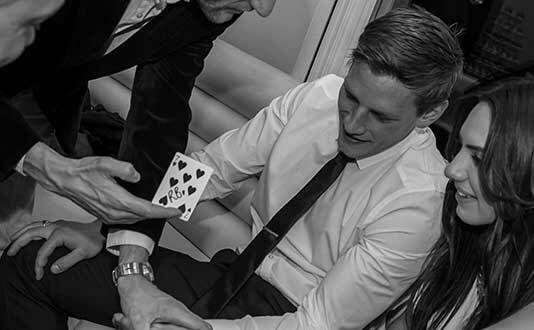 Similarly as the evening guests arrive – magicians for weddings are perfect at introducing guests to one another and providing of close-up magic in small groups which is perfect for those who maybe don’t want to dance or who a loitering around the bar. Steve’s mix and mingle style also extends as far as table magic. This is perfect for the wedding breakfast but, Steve can seamlessly move between tables and guests and help take the pressure off the catering if there are delays or issues. You can see a taster of his work here. Hiring Steve for 2 hours is an ideal time for them to feasibly get round guests from 50 upwards. The more guests you have the less time he is able to spend with each group. However, for numbers of 50-200 for 2 hours is usually recommended.